A new tower at Dignity Health’s St. Rose Dominican Hospital, Siena Campus, promises improved and expanded care from the emergency room to the operating room to the private-patient room. 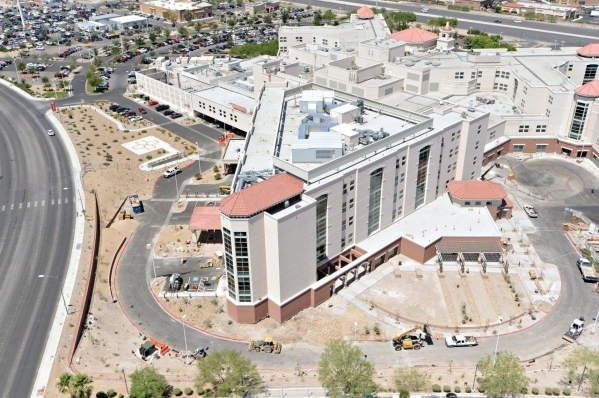 The addition, which is scheduled to open in mid-August, will increase the hospital’s capacity to 326 private rooms and more than double the size of its emergency room, according to Dignity Health officials. Siena’s emergency room is the third busiest in Southern Nevada and has a level III trauma center. The new emergency room more than doubles the capacity, and Siena hopes to be designated as a level II trauma center, Dignity Health officials said. The new five-story tower adds 96 private rooms, bringing the total to 326. The 220,000-square-foot addition includes 56 emergency bays, six operating suites, expanded cardiovascular services, and more space for admitting, nutrition services, radiology, lab, pharmacy, endoscopy suites and other high-demand outpatient support services, according to Dignity Health. As a tertiary facility, Siena provides specialty care for particular service calls with specialized physicians and specially trained staff and equipment. A tertiary facility is more technical and is designed for procedures and cases that are more complicated in nature, Conley said. The new tower at Siena will be able to handle more higher-acuity trauma cases, and it will have a pediatric intensive care unit with a specialized staff that knows how to handle pediatric patients when they are in acute or serious conditions, Conley said. Once the new tower is occupied, the older building on the campus will be refurbished and will get infrastructure upgrades. For example, rooms in the new facility are being installed with patient lift equipment. Once the new tower is completed, similar equipment will be installed in rooms in the older facility. Conley said the new emergency department will open first. She is projecting it will see its first patients the week of Aug. 18. The staff is expected to take occupancy of floors 2-4 about 60 days after that. The fifth floor is being held open for future growth. “The unique thing about construction in health care is that hospitals never close, and we have to do construction projects around on-going services,” Conley said. “This was a phased construction project, and we’ve been bringing up certain phases at different times while we continue to occupy the building. In the first phase, we added 11 neonatal intensive care unit beds, which is another tertiary service, and we completed that about a year and a half ago. The contractor is Kitchell of Phoenix. All of these additions should help dispel the old saying that local residents must leave the area to get good health care. Doug Geinzer is CEO of Las Vegas HEALS, an organization that fosters strategic alliances in the health care community, collaborating on workforce issues, and lobbying for legislative initiatives to improve access and the delivery of quality health care in Southern Nevada. “One area of focus for Las Vegas HEALS is communicating the high caliber of health care that already exists in Las Vegas,” he said. And although the new addition will improve health care in Southern Nevada, it also should help improve the local economy. The new tower, which will cost about $160 million, will also provide an estimated 300 additional jobs for the area when it opens later this month. Conley added that once the tower is completely finished, the hospital should need to add 600 to 700 total jobs. The Siena campus currently employs about 1,500. “Of course, we’ll be adding any hospital-type related profession — more physicians, bedside nursing staff, RNs, nurses’ aides, respiratory therapists, radiology and imaging technicians and more,” Conley said. “We’ve filled most of the management positions, but we are also looking for environmental services workers, food service workers, facilities, plant operations, mechanics, electricians — it really spans the spectrum.